WHERE WOULD YOU CHOOSE TO BE ON A MONDAY MORNING?" "HOW ABOUT THE ISLE OF ANGLESEY?" Imagine unexpected and reassuring discoveries along the Island's Coastal Path. Imagine yourself on Golden Beaches that are softer, sweeter and longer than childhood memories. Imagine catching and riding that unforgettable wave. Imagine building ambitious sandcastles with your children or grandchildren or just being thrilled at a child's fascination of rockpool beasties. Imagine a glorious sunset while holding your loved one's hand and easing out a gentle, joyful sigh. Imagine wandering along narrow roads through gently rolling countryside. Imagine rediscovering that part of your soul you'd forgotten about while trying to be someone else. Leave your city driving behind and grab an ice-cream. 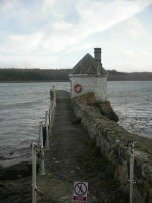 WHAT'S THE ANGLESEY HIDDEN GEM WEBSITE ALL ABOUT? A golf course for almost every day of the week. You might as well spend one day realising the fairway isn't the only thing you've been missing. You'll discover 27 of the finest beaches in the whole of the United Kingdom and the best coastal path anywhere this side of Paradise. Family Sandy Beaches, Small Sandy Bays and intriguing Rocky Coves. 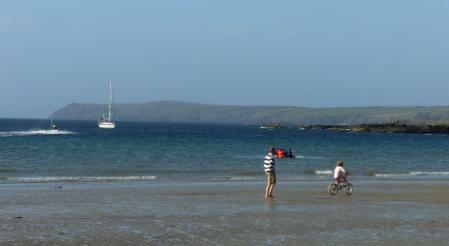 Every beach is joined to the other by the stunning Coastal Path that circles almost 125 coastal miles. This is TRAETH YR ORA BEACH by Dulas Bay. I'll add to that. I REALLY LOVE Anglesey. There again, I do happen to live in one of the most beautiful parts of Wales. 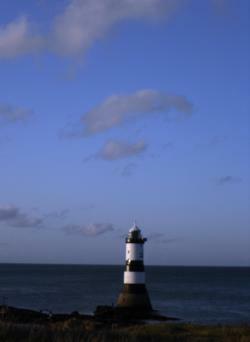 I live on an island off the North Wales coast. Okay. 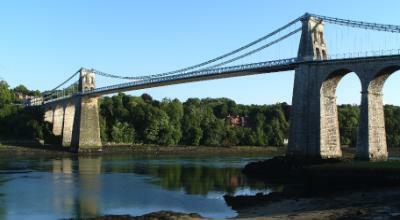 So I know it's joined to the mainland by Thomas Telford's glorious Menai Suspension Bridge and Robert Stephenson's Britannia Bridge. Nonetheless, it is an island and we hang on tenaciously to our Island identity. It's a wonderful Hidden Gem that I want to share with you for your credit crunch holiday (or vacation, if you're a colonial). Believe me, there is so much to see. Grab the menu! Grab your picnic! Grab your boots! Grab your fishing rod! Grab your surf board! Grab your bucket and spade! Grab them all! Be your own Hero. 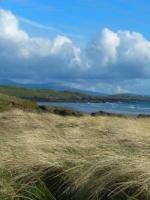 Anglesey is surrounded by the sea and good clean winds most of the year. So, if the wind and waves are not to your liking on one coast, then pack your wagon. Head for the other side. North, East or West. There's always something going on. It doesn't matter if you're looking for a beach to 'conduct a barbecue', idle and laze or face the challenges of the sea. These beaches will satisfy your needs. I've never fished off the beaches. But I know people who do and they tell me the Island got one of the best sea fishing coastlines in Britain. Anglers regularly travel from as far away as Blackpool and Northern Ireland. Probably further. 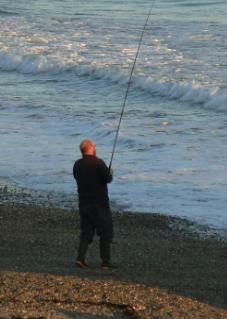 Read Brian's latest tips about FISHING AT CYMYRAN BEACH. For when you want to knock a few balls, then we've got six golf clubs along with two driving ranges on the Island. Click Here for More On Anglesey Golf Clubs. Each view, monolith or ancient church reveals an astonishing history when you just stop and ask. 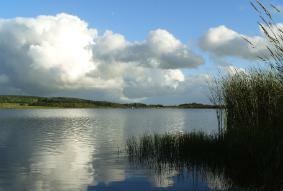 If you walk back a few hundred yards from Llyn Llywenan at this spot you'll discover a very small chapel called Ainion. 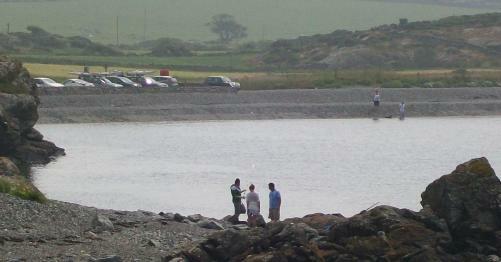 It didn't matter how awful the weather the people would walk from the chapel to the lake to be baptised. In fact, baptisms still take place in the lake. Anglesey is immersed in terrible historical events. It was one of the very last parts of Roman Britain to be conquered. Quite simply, the Romans were more fearful of Anglesey Druids than Druids anywhere else in Britain. If you do a bit of reading into the period you'll learn that when the Romans marshalled their forces to finally take the Island, the troops nearly lost their nerve. It wasn't the Druidic host and legends of magic and human sacrifice that terrified the Roman legion. These days our women are both fair and beautiful ladies and a lot less predisposed to terrify visitors. I remember travelling in the Inner Mani region of the Greek Peloponese many years ago. It was starkly beautiful but certain aspects of that place leave you deeply unsettled. It has an appalling history. Maybe it's our own ancient and violent history that still clings here and there on the Island. It can be equally unsettling. But it's not all like that. Last year I discovered a wonderful little track down to Dulas Beach. It's well worth the driving adventure to find this magic place. Leave the car at Lligwy Beach and saunter back up the hill. 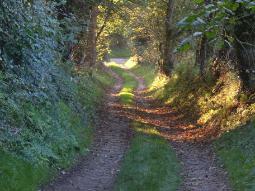 Then down this beautiful lane to Dulas Beach on the other side of the headland. Choose a beautiful Autumn evening bathing you in gentle sunshine. Why not CLICK HERE and join me in a gentle evening amble down to Dulas Beach. Gaze enviously at the small cottages along the way. WHY NOT ENJOY AN ISLAND BREAK? Early Autumn is the only time when the fresh green beauty of an Island Spring is seriously challenged. As Summer ends, Nature gently guides us into Autumn. The bronze sunshine of the early evening bathes many secret places in a romantic mantle. You'll discover many of these natural treasures yourself. Let me help you. I'll share with you the magic locations I have discovered myself after living on the Island for most of my life. 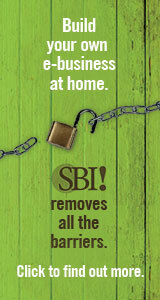 Why not rent a cottage or farmhouse for your stay? Whether you're travelling budget or looking for that something special, Anglesey can help make your dream holiday just perfect. Now there's an idea worth thinking about.